We have published a more recent supplementary information page. See our most recent supplementary information page for GiveDirectly. This page contains further discussion and information for our review of GiveDirectly. This page is intended to provide supplementary information on topics covered in the main review and is not intended to be read independently of the main review. The information on this page is less frequently updated than our main review; there is a note at the top of each section indicating when it was last updated. Are the size and structure of the cash transfers well-thought-through and appropriate? GiveDirectly's standard model involves grants of approximately &dollar;1,000 (USD) over about four months, after which recipients become ineligible for further grants.1 GiveDirectly has told us that it adjusts its transfer sizes for purchasing power; as of late 2015, in Kenya, GiveDirectly transferred approximately &dollar;1,040 to each enrolled household, while in Uganda, it transferred approximately &dollar;875.2 We are not sure what the size of transfers in Rwanda will be, but expect it to also be about &dollar;1,000 per household. This is a different approach from the approach we've seen in government cash transfer programs. One way of putting the difference (which has been reflected in GiveDirectly's communications with us) is that government programs aim for "income transfers" (small supplements to income over many years), whereas GiveDirectly's standard program aims for "wealth transfers" (large, one-off transfers that hopefully give people more flexibility to make large purchases and investments). GiveDirectly's basic income guarantee program (expected to launch in late 2016) will be structured as "income transfers." GiveDirectly's standard transfer schedule involves a small initial transfer (or "token" payment) of about &dollar;90 (USD), followed by two larger transfers of about &dollar;475 (USD).3 GiveDirectly aims to send these transfers over a period of approximately 4 months.4 GiveDirectly has an ongoing study of behavioral interventions that will allow some recipients the ability to choose when they receive their transfers (see this spreadsheet). Note that we have reviewed the data GiveDirectly used in some of the examples above (see footnotes). Rwanda benchmarking project: In 2015, GiveDirectly finalized an agreement for a partnership project in Rwanda. GiveDirectly will be implementing cash transfers in two randomized controlled trials; the studies will cost &dollar;4 million and are co-funded by an institutional funder and Google.org.40 The studies will test cash transfers as a benchmark against other aid programs funded by the institutional funder.41 GiveDirectly started enrollment for one of the studies in 2016, for which it expects results in late 2017, and as of August 2016 was finalizing the structure of the second study.42 GiveDirectly has provided us with some additional details about the studies, which are not yet public. Chief Operating Officer International (COO-I): The COO-I provides oversight and quality control of cash transfer programming and international operations. The COO-I oversees the Country Directors. It is our impression that GiveDirectly has grown substantially in 2016 and the numbers above may no longer accurately represent its current size. In mid-2014, three members of GiveDirectly's board of directors began the for-profit technology company Segovia, which develops software that NGOs and developing-country governments can use to help implement their cash transfer programs.57 Paul Niehaus and Michael Faye, co-founders of GiveDirectly and Segovia, split their time between the two organizations.58 They previously told us that they track their time allocation to projects and would be able to share details of how much time they each spend on GiveDirectly and Segovia; however, when we requested this information, GiveDirectly told us that it had previously understood that we no longer wanted this information so it had stopped explicitly time tracking. This was a miscommunication, but we decided not to ask GiveDirectly to track this going forward. GiveDirectly estimates that the time Faye and Niehaus collectively spend on both organizations amounts to each organization having the equivalent of a full-time CEO.59 One other staff member who was previously working full-time at GiveDirectly now works part-time for each entity.60 We discuss potential risks from the overlap in staff in this blog post. Although we believe that there are possibilities for bias in this decision and in future decisions concerning Segovia, and we have not deeply vetted GiveDirectly's connection with Segovia, overall we think GiveDirectly's choices were reasonable. However, we believe that reasonable people might disagree with this opinion, which is in part based on our personal experience working closely with GiveDirectly's staff for several years. GiveDirectly's assets and vulnerability criteria may help GiveDirectly expand to new areas more easily and could provide valuable guidance for other cash transfer programs (although we are unsure if GiveDirectly will be able to share learnings from this project since it hopes to keep its algorithm confidential). However, our evidence for GiveDirectly's impact and for low rates of conflict within villages is based on previous campaigns in which GiveDirectly used different eligibility criteria, and it is possible—although we think unlikely74—that these criteria will substantially change these outcomes. Well over half of adults skip meals, less than half of household members eat until they are content, people commonly go to sleep hungry and a paltry 18% report having enough food for tomorrow in their household. Those living in eligible homes are even worse-off than the average household, consuming less and holding fewer assets. Overall, mean and median daily per capita consumption among eligible households are &dollar;0.65 and &dollar;0.55 at nominal rates, and 74% are below the Kenyan poverty line, indicating a very poor population. End-line data on food consumption among control group recipients from GiveDirectly's RCT also suggests that the thatched-roof eligible households are extremely poor.78 This data shows that "20% [sic] of the control group reports that not all household members usually eat until they are content, 23% of respondents report sleeping hungry in the last week, and only 36% report having enough food in the house for the next day. "79 Other results related to food consumption are measured as well, which are, in our view, consistent with the notion that recipients are extremely poor. How much poorer are those selected by GiveDirectly's criteria? What do housing materials or assets indicate about financial management? Are the benefits of targeting the poorest worth the costs? For several of GiveDirectly's past campaigns, GiveDirectly staff surveyed recipients on how they used their cash transfers during the follow-up calls.96 The surveys were conducted at different points in the transfer cycle of each campaign.97 We summarize the data from the more recent campaigns in Kenya and Uganda below. The spending data from Kenya covers portions of the Kenya 2M, Kenya 1.2M, and Kenya rolling campaigns, and covers dates from February 2014 to September 2015. The spending data from Uganda covers some of the Uganda pilot campaign from October 2013 to April 2014.98 Note that we do not put much weight on this data, as it is all self-reported and we have no control group to compare it to. We summarize survey data from several campaigns in Kenya and the pilot campaign in Uganda for some of the questions included in these surveys. We have limited information on the cost-effectiveness of GiveDirectly's basic income guarantee program. While we have modeled the basic income guarantee program in our cost-effectiveness analysis, we do not have a high degree of confidence in our results. Our model indicates that GiveDirectly's standard cash transfer campaigns are roughly 1.5 to 2 times more cost-effective than the basic income guarantee program.113 The difference in cost-effectiveness is partially driven by the fact that GiveDirectly is raising funding for the basic income guarantee study upfront and investing it in a low-risk portfolio. On average, because one arm of the study will receive cash transfers for 12 years, this funding won't be spent for multiple years, so the benefits from the funding are discounted. As we have mentioned above, it is our impression that GiveDirectly has increased its focus on experimentation and partnerships. We expect the structure of benchmarking cash transfer programs could look substantially different from GiveDirectly's standard model in some cases. For example, GiveDirectly has told us that if it is benchmarking cash against a program that distributes food stamps, GiveDirectly might disburse smaller and more frequent payments (which recipients are more likely to spend on food) to make the programs more comparable.116 As with the basic income guarantee program, and for similar reasons, benchmarking projects could be more or less cost-effective than GiveDirectly's standard program. GiveDirectly sends each recipient household &dollar;1,000, or &dollar;200 per person for an average household. These payments are spaced out in time to respect limits imposed by the M-PESA system and to give recipients time to plan for them, but should be thought of as wealth and not income transfers. GiveDirectly sized transfers at this level to ensure that they are fair, well-understood, and potentially transformative. &dollar;406 per household per year for participants in Progressa / Opportunidades, and up to &dollar;4,059 in total over ten years. &dollar;524 per household per year for participants in Bolsa Familia (Brazil) in 2011, and a maximum of &dollar;7,855 in total over five years. If anything we would lean towards transferring more than these programs do, since they serve people starting from a higher level of wealth. Potentially transformative. Because cash transfers are flexible by design there are a number of relevant ways to think about what they could do for a recipient. If invested at a 25% real rate of return, the transfer would allow the average recipient to permanently increase his/her [daily] consumption by &dollar;0.14 over a baseline level of &dollar;0.65, a 22% increase. 5.2 years of basic food requirements for one adult. 1.2 acres of land, which is 1.8 times average baseline landholdings among eligible households. Regarding "fair:" Pre-cash-transfer wealth/income differences between eligible and ineligible recipients may exist for a number of reasons; we don't believe it's warranted to assume that a fair world would see the two groups with the same wealth/income due to an equalizing transfer, and more to the point, we don't believe that the ineligible households are likely to see the situation as fair. In addition, we are concerned that by aiming to equalize eligible and ineligible households, GiveDirectly takes on a substantial risk of its calculations being off in a way that leads to eligible households becoming systematically better off than ineligible households, which could distort incentives and lead to conflict. GiveDirectly, Inflation analysis - Kenya. Note that the inflation analysis does not include information on how the transfer size should be adjusted in Uganda, so we are not sure how GiveDirectly settled on the Uganda amount. Note that GiveDirectly sets its transfer sizes in the currency of the country in which it operates. So, if the exchange rate between that country's currency and the dollar changes, the transfer size in U.S. currency may appear to fluctuate, even if GD is transferring the same amount to recipients. "1 KES = 0.00947200 USD" XE currency converter, Kenya shillings to US dollars, September 25, 2015. So 10K KES = &dollar;94.72, and 50K KES= &dollar;473.6. GiveWell Household size analysis. Note that this data is based on a small sample from one of GiveDirectly's first campaigns (the Siaya campaign). Mean daily per capita consumption among eligible households = &dollar;0.65. GiveDirectly, Offering Memorandum (January 2012) Pg 24. Note that recipients in Uganda have a slightly higher average daily consumption of &dollar;0.83, according to GiveDirectly's website. GiveDirectly, What We Do - Operating Model, see the Uganda tab. Rwanda: GiveDirectly chose to work in Rwanda to pursue a partnership with a bilateral aid donor after staff at the Rwanda office of that donor approached GiveDirectly about a possible cash transfer program there. The employee heard about GiveDirectly through an NPR news piece and became excited about the prospect of GiveDirectly working in Rwanda. GiveDirectly and the donor were then able to secure interest from Google in co-funding such a project through mutual connections. Paul Niehaus and Carolina Toth, conversation with GiveWell, May 28, 2015 Rwanda also has a growing mobile money system and a large population of extremely poor potential recipients. "While the results of this project will be applicable in many places, Rwanda is an ideal setting in which to conduct it. Rwanda features a) a burgeoning mobile money landscape, with 17% mobile money penetration in mid-2013 as per National Bank of Rwanda and cell phone penetration at 72% in September 2014, b) a sizeable population of poor households (45% below the poverty line), and c) a track record of prioritizing transparent and innovative aid programming." GiveDirectly, Rwanda technical application Pg 5. We have reviewed poverty data that GiveDirectly sent us for Uganda. We have not written up the process we used to review this data. GiveDirectly has not yet selected regions within Rwanda. Kenya: To select counties in Kenya, GiveDirectly told us that its executive staff uses data on poverty, population density, security, and presence of poverty-focused NGOs (with the goal of avoiding overlapping with these organizations). "County level – we look at data on poverty, population density, presence of poverty-focused NGOs (which we try to avoid), and security. "GiveDirectly, Operational process overview Pg 1. Uganda: For Uganda, GiveDirectly told us that it chose a county to target initially based on poverty statistics, logistical factors and security considerations. We have seen poverty data for Uganda. GiveDirectly sent us the poverty data, which we internally reviewed. Rwanda: GiveDirectly has not yet selected districts in Rwanda to work in. We have not seen examples of or asked GiveDirectly to describe in detail how it selected sub-county locations in Uganda or Rwanda. Pilot campaign in Uganda: For the pilot campaign in Uganda, GiveDirectly relied on publicly available poverty data, which we have reviewed, as well as data that it received from local officials, which we have not reviewed. Conversation with Piali Mukhopadhyay, COO, International, GiveDirectly, October 22, 2013 GiveDirectly also sent field staff to test cell phone reception and measure proximity to market centers, and used these as inputs into its village selection (optimizing for good reception and longer distances from market centers). Conversation with Piali Mukhopadhyay, COO, International, GiveDirectly, October 22, 2013 GiveDirectly also considered population size in the villages, so that it could enroll all eligible households in each village and not exceed the budget for the Uganda pilot campaign, which was funded by part of its Google Global Impact Award. Previously, in the Kenya 1.2M campaign, GiveDirectly selected villages by manually estimating the proportion of thatch- to iron-roof homes with satellite imagery. In the Kenya rolling enrollment campaign, GiveDirectly used a machine learning algorithm to estimate thatch-iron proportions at the village level based on satellite imagery. In the Uganda 2M campaign, GiveDirectly relied on parish-level census data with poverty measures, as well as mobile money coverage. GiveDirectly, Update for GiveWell, April 2014, Pg 3. GiveDirectly, Operational process overview, Pg 1. Ensure Governor’s office and relevant Country admin officials informed of expansion activities"
Attain approval letters from RDC, District Security Officer, District Intelligence Officer, and District Development Officer for local renewal"
GiveDirectly, Update for GiveWell, October 2014, Pg 9. "Enumerators enter villages, engage a local to serve as guide for the day, and enumerate all households living in the village, noting which homes are eligible." GiveDirectly, Operational process overview, Pg 2. 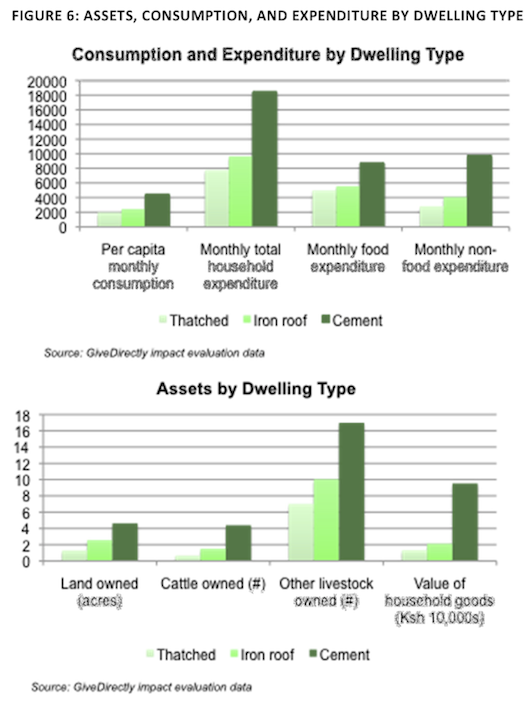 "Household level – we enroll households living in mud and thatch homes." GiveDirectly, Operational process overview, Pg 2. GiveDirectly also gives each household a "token" during the census: "During census, we provide each household with a card with a number on it (a “token”). When we then seek to enroll eligible households, we ask to see the token. This helps ensure that the household being enrolled is the same as the one that was censused and we deemed eligible based on that information." GiveDirectly staff, responses to monitoring questions, October 11, 2016, pg. 1. "Enrollment. A second, distinct enumerator returns to enroll households identified as eligible, give them a SIM card and instructions on how to register if needed." GiveDirectly, Operational process overview Pg 1. Kenya: In Kenya, registration involves giving the household member a SIM card (if they do not already have an M-PESA account), which is used to transfer funds through the M-PESA system, and collecting other data that can be checked against the initial data from the census. Recipients are also given the option of purchasing a cell phone from GiveDirectly at the time of registration, the cost of which is removed from the recipient's transfer (Conversation with Paul Niehaus, President, and Michael Faye, Director, GiveDirectly, October 6, 2012). "GiveDirectly gave cash transfer recipients the option of spending some of the money that they receive to buy a phone provided by GiveDirectly." Conversation with Paul Niehaus, President, and Michael Faye, Director, GiveDirectly, October 6, 2012, pg. 3. "Enrollment. A second, distinct enumerator returns to enroll households identified as eligible, give them a SIM card and instructions on how to register if needed… We check that the data collected in enrollment and the village census match." GiveDirectly, Operational process overview, pg. 1. See process description in GiveDirectly, Operational process overview, pg. 3. "Do recipients need to have a mobile phone to participate? "How do you prevent corruption? GiveDirectly told us that in Uganda, it is possible to purchase ID cards that can be formally approved by the signature of one's Local Councilperson. GiveDirectly helped recipients obtain ID cards by purchasing the cards, sending field staff to villages to take photographs of recipients, printing the photographs for the ID cards at a local printer, working with Local Councilpeople to approve the cards, and arranging for recipients to collect their cards. "During census, we provide each household with a card with a number on it (a “token”). When we then seek to enroll eligible households, we ask to see the token. This helps ensure that the household being enrolled is the same as the one that was censused and we deemed eligible based on that information." GiveDirectly staff, responses to monitoring questions, October 11, 2016, pg. 1. "[GiveWell]: How are the questions about recipients being an imposter asked? (Columns DM and DN) Are these questions asked of neighbors, or judgment calls made by the enrollment team, or something else? [GiveDirectly staff]: These are usually asked of neighbors, the resident guiding us through the village or sometime a village elder. An example of the question asked is: 'Does so and so live here? How long have they lived here?'" GiveDirectly staff, responses to monitoring questions, October 11, 2016, pg. 2. "Field officers are asked to record when they suspect a recipient of being dishonest. For example, a polygamous husband may try to claim that one of his daughters is actually an additional wife in order for her to qualify for an additional payment (since we enroll each wife in a polygamous household). A field officer might discover this when reviewing documents provided by the daughter or others in the household (e.g, if a document says the family has 3 daughters but they present as having only 2). Usually, the field officers also ask the neighbours and their guides, whose information they use to corroborate what the recipient told them during the interview." GiveDirectly staff, responses to monitoring questions, October 11, 2016, pgs. 2-3. For example, see GiveDirectly, Uganda pilot enrollment database - Akumure. Note that even households that have passed the "Registration" phase (starts in column AB) must still go through the "Back check" phase (the "Census-registration comparison" (column EF), "Photograph check" (column EP), and "Remote Check" (column ES)), and a possible "Audit" (column FH) before their final enrollment status is determined (columns FK and FL). "Back-checking. Another enumerator, distinct from the census and enrollment workers, revisits each enrolled household to check that they eligible, didn’t have to pay a bribe to enroll, etc." GiveDirectly, Operational process overview, Pg 3. "In early 2016, GiveDirectly allocated a fairly large sum of money to test a new implementation model in Kenya. A separate field director and team were hired approximately six months ago, and the experiment is taking place in an area close to GiveDirectly's other field operations. The primary aim is to double the program's size in 2017 without significantly increasing the management structure. The new model seeks to increase throughput per manager by eliminating the token payment and back check steps. GiveDirectly will assess gains in throughput as well as costs, which might occur in the areas of comprehension and fraud. Results and data should be available after a few months of disbursements. By the end of 2016, GiveDirectly hopes to have a blueprint for implementing a similar model in other countries." GiveWell's non-verbatim summary of a conversation with Ian Bassin and Piali Mukhopadhyay, GiveDirectly, August 23, 2016, Pgs 4-5. Recipient Comprehension: With the removal of back check, we are tracking any deviation in recipient comprehension below 90% (our preferred rate). We are tracking this through additional survey questions in both audit and our follow up surveys where we ask recipients their understanding of our program. Additionally, Associate Field Managers will be conducting quality check surveys at audit stage for another data point on recipient comprehension. Transfer Integrity & Adverse Events Detection. Given additional risk of two payment structure, we will be assessing (on a bi-weekly basis) the percent of transfers reversed and percentage of adverse events happening after first payment and after second payment. This will then be compared to our standard quality bar to assess significant deviations. Given a greater need for over the phone assistance, we will also be tracking through our follow up program the percentage of recipients who received no customer service and tried. Fraud Detection. With the removal of back check and a two payment structure that makes each payment riskier, we will be checking the percentage of recipients flagged for additional audit stage and then the percentage of those deemed ineligible after audit is conducted. We also have an internal audit team in place that will be conducting surveys post-payment to see if fraud occurred." In Kenya, the field staff who do audits are not involved in earlier enrollment activities: "[In Kenya] the follow up team sends some of its members to do audits and staff are not pulled from prior enrollment teams." Conversation with Carolina Toth, GiveDirectly, November 20, 2014. In Uganda, the field staff who have done audits in past campaigns were from earlier enrollment teams. Conversation with GiveDirectly field staff, October 20-21, 2014 (Note that this point was not included in the notes from this conversation). However, GiveDirectly has told us that it ensures that staff members never revisit households that they helped through previous steps of the enrollment process: "In GiveDirectly's standard operating model, each field officer is responsible for completing one type of step in the enrollment process; for example, a field officer might be assigned to the 'backcheck team.' In two of its experimental campaigns (the experiment to increase throughput in Kenya and its work in a coffee farming community), GiveDirectly is experimenting with a "wave" approach. In this scenario, the same officers perform multiple steps; however, for steps intended to provide a check on previous steps, officers do not perform multiple steps in the same village. This ensures that the same field officer does not visit a household twice during the enrollment process." GiveWell's non-verbatim summary of a conversation with Ian Bassin and Piali Mukhopadhyay, GiveDirectly, August 23, 2016, Pg 5. "GiveDirectly has adjusted some of its audit flags based on factors such as changes in enrollment numbers and eligibility criteria. Households might be flagged for an audit for a variety of reasons, including SIM card mismatches, GPS coordinate distance mismatches beyond a certain threshold, and, in programs where housing materials affect eligibility, the appearance of a metal roof on a recipient's home after registration." GiveWell's non-verbatim summary of a conversation with Ian Bassin and Piali Mukhopadhyay, GiveDirectly, August 23, 2016, Pg 4. Each mismatch in recipient information is assigned a certain weight depending on how likely it is to be an indication of gaming. (GiveDirectly said that it determined the likelihoods of various mismatches indicating gaming by conducting an analysis of the mismatches present in past cases of gaming. We did not review this analysis.) GiveDirectly said that the mismatches with the highest weights are mismatches in identifying photographs and housing materials. Each recipient is assigned a total mismatch "score" (the composite of all their weighted mismatches). Recipients with scores above a certain level are audited. GiveDirectly gave permission to publish the following databases on the condition that all personally identifying information was removed. Due to the size of the databases, we have not yet anonymized them and therefore have not published them. If you are interested in the content of these databases, please contact us at info@givewell.org. "GiveDirectly conducts follow-ups with all recipients after the token and first lump sum payments, respectively. In campaigns in which recipients receive larger numbers of payments, follow-ups might be done near the beginning, midpoint, and end of the process rather than after each payment...In both Kenya and Uganda, GiveDirectly conducts in-person follow-ups with recipients flagged as 'vulnerable.' Vulnerability flags include a recipient designating a trustee to receive payments on his or her behalf." GiveWell's non-verbatim summary of a conversation with Ian Bassin and Piali Mukhopadhyay, GiveDirectly, August 23, 2016, Pg 3.
few percent for folks not reached by phone"
There are short verification calls to confirm that the transfer was received and ask if the recipient experienced any problems after each transfer. Conversation with Piali Mukhopadhyay, COO, International, GiveDirectly, October 22, 2013 There are also two longer surveys administered to a randomly selected sample of recipients after larger portions of the transfers have been sent. In the longer surveys, GiveDirectly staff ask recipients a number of questions including whether they received the transfers or had any trouble withdrawing funds, how they spent the funds, and whether there were any problems in their community relating to the transfers. In early transfer campaigns, GiveDirectly transferred a first, full installment to recipients before its first call; in its Google campaign, GiveDirectly implemented the initial small transfer to enable it to identify problems before transferring the larger amount. Piali Mukhopadhyay, COO, International, GiveDirectly, conversation with GiveWell, November 7, 2012. "For its standard Kenya and Uganda programs, GiveDirectly has implemented a rule in Segovia to block payments until the previous one has been confirmed: for example, first and second lump sum payments are blocked until token and first lump sum payments, respectively, have been confirmed via a follow-up call or visit. In an effort to ensure implementation quality, GiveDirectly seeks to keep the percentage of households with blocked payments under 5%. The delay between the first and second lump sum payments tends to be the longest. After the final payment, GiveDirectly aims to follow up with a geographically representative sample of roughly 50-60% of households. Staff in Kenya and Uganda have been focused on following up on the first two payments because of the new rule described above; they are in the process of catching up on the schedule for final follow-ups." GiveWell's non-verbatim summary of a conversation with Ian Bassin and Piali Mukhopadhyay, GiveDirectly, August 23, 2016, Pg 4. We have reviewed the records of calls made to GiveDirectly's Kenya hotline from May 2012 – September 2014. GiveDirectly, Follow-up tracker, October 2014 (January 2013-September 2014). This file also contains issues reported through other channels, such as to field staff during field visits and during follow up surveys. GiveDirectly plans to make available up to &dollar;15 million of the grant it received from Good Ventures in 2015 to match funds committed by the major funder. The &dollar;15 million that each has offered is not committed: "GiveDirectly is offering up to &dollar;15 million in matching funds on a first-come, first-served basis to fund these types of projects. GiveDirectly hopes that offering the matching funding will incentivize large funders to move quickly on partnership projects. If all of GiveDirectly’s partnership projects discussions came through, GiveDirectly would need to contribute &dollar;23-30 million. While GiveDirectly cannot fund all of the projects it is currently discussing, it would consider talking to partners about opportunities to fund any projects approved by these potential funders that are beyond GiveDirectly's funding limit." GiveWell's non-verbatim summary of a conversation with Paul Niehaus, Carolina Toth, and Ian Bassin, August 12, 2016, Pg 5. "GiveDirectly has an agreement with a partner that would fall into these categories and could result in GiveDirectly running projects in up to 4 new countries." GiveWell's non-verbatim summary of a conversation with Paul Niehaus, Carolina Toth, and Ian Bassin, August 12, 2016, Pg 4. How much working in the country would increase GiveDirectly's geographic diversity. 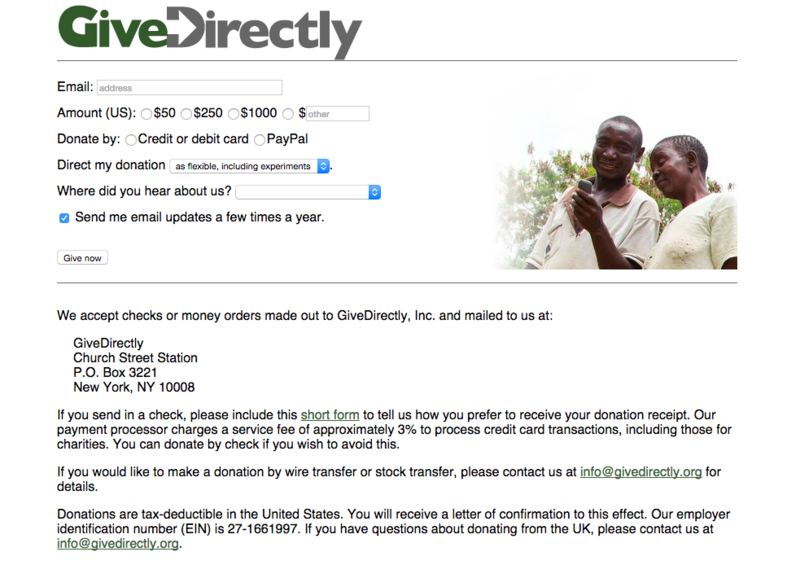 GiveDirectly would like to test its program outside of East Africa. How quickly GiveDirectly will be able to set up operations in the country. The easiest countries for GiveDirectly to set up in will likely be those in East Africa. Whether or not GiveDirectly can find an on-the-ground staff member who is willing to push forward the benchmarking project. GiveDirectly's experience in Rwanda has taught it that having such a "champion" can be invaluable. According to its agreement with the institutional funder, GiveDirectly is not allowed to reach out to country-level staff to gauge their interest in a benchmarking program. Rather, first the staff must express interest in a partnership with GiveDirectly. Once interest is expressed, GiveDirectly has a high-level conversation with the country staff. If that conversation goes well, GiveDirectly will be invited to submit a proposal for a benchmarking project to the country staff. GiveDirectly and the country staff then negotiate the details of the proposal and sign a contract. In Rwanda, GiveDirectly signed the contract while it still left many details to be worked out later, and this caused difficulties down the road. GiveDirectly now intends to bring up many details about the program during the negotiation stage. Once the contract is signed, GiveDirectly and the country staff can enter the implementation phase. "One of GiveDirectly's strategic goals for 2016 is to finalize these negotiations, which it believes would lead to two new countries it will work in. It aims to have tentative agreements in place by the end of the year. GiveDirectly aims to balance its priorities between moving forward quickly with new projects and rolling them out sequentially, which is easier from a management standpoint. Starting and scaling up projects in 4 new countries at once would be a significant challenge." GiveWell's non-verbatim summary of a conversation with Paul Niehaus, Carolina Toth, and Ian Bassin, August 12, 2016, Pgs 4-5. "Greater leverage for FD to work on tech integration, high-level analysis (e.g. “smart” audits)" GiveDirectly, Update for GiveWell, October 2014, Pg 6. In Uganda, GiveDirectly hired some of the highest performing FOs from the pre-transfer FO staffs to stay on as FOs who would conduct follow-up surveys. (Conversation with Piali Mukhopadhyay, COO, International, GiveDirectly, October 22, 2013). It is our impression that FOs who conduct follow-up surveys are often hired out of the pre-transfer FO staffs. What GiveDirectly uses Segovia for: "Segovia, the product GiveDirectly uses for end-to-end data management, enables GiveDirectly to track recipients' progress through each step of its enrollment, payment, and follow-up processes and manage other tasks such as data merging, matching checks between different steps, audit flags, and roster generation. Currently, Segovia automatically generates lists of pending payments, but GiveDirectly must log in to a mobile payment portal, such as M-Pesa or MTN, to upload payments; this additional step takes time and could pose a security risk. Segovia is working to bring the entire payment process into Segovia by directly integrating GiveDirectly's platform with the payment portals. This new feature should be available within the next quarter. Segovia's monitoring and reporting tools, including its dashboards, provide significant value to GiveDirectly, particularly as its campaign numbers increase." GiveWell's non-verbatim summary of a conversation with Ian Bassin and Piali Mukhopadhyay, GiveDirectly, August 23, 2016, Pg 1. "Mr. Faye and Dr. Niehaus split their time between Segovia and GiveDirectly, and make efforts to ensure that each organization always has the equivalent of one full-time CEO. For the sake of efficiency, staff member Melissa Harpool, who manages Mr. Faye's and Dr. Niehaus' schedules across Segovia and GiveDirectly, is employed by both organizations. All of the other staff members are employed by only one of the two organizations. There have been no issues related to staff leaving one organization for the other; the organizations' respective staff profiles are quite different." GiveWell's non-verbatim summary of a conversation with Ian Bassin and Piali Mukhopadhyay, GiveDirectly, August 23, 2016, Pg 3. "For the sake of efficiency, staff member Melissa Harpool, who manages Mr. Faye's and Dr. Niehaus' schedules across Segovia and GiveDirectly, is employed by both organizations." GiveWell's non-verbatim summary of a conversation with Ian Bassin and Piali Mukhopadhyay, GiveDirectly, August 23, 2016, Pg 3. We mention this in this blog post. If GiveDirectly pays for Segovia's services, then in some sense GiveDirectly is contributing additional income to its co-founders, who are also the co-founders of Segovia. "Michael Faye and Paul Niehaus are co-founders and board members of both GiveDirectly and Segovia. In order to mitigate the potential legal and ethical risks of this situation, they are recused from GiveDirectly's decisions about Segovia. Ms. Mukhopadhyay and Gavin Walsh, Director of Finance and Information Systems, manage the decision to do business with Segovia and the details of that contract. During recent contract negotiations, they assessed the quality and cost implications of building a similar product to Segovia in-house, because no similar product is offered by any other vendors. They concluded that using Segovia's product was the best option and negotiated a pricing model with its product lead and head engineer. GiveDirectly received a discounted quote in line with the planned volume of transfers. Ms. Mukhopadhyay and Mr. Walsh's proposal was accepted by the other independent board members. In making this decision, board members reviewed information about the extent to which Segovia's growth relies on GiveDirectly's business to ensure that GiveDirectly was not too large a percentage of Segovia revenue; this was out of a concern that such a scenario could cause some to question the relationship even if the decision to use Segovia is independently sound." GiveWell's non-verbatim summary of a conversation with Ian Bassin and Piali Mukhopadhyay, GiveDirectly, August 23, 2016, Pgs 2-3. "Geography: Homa Bay, where thatch is uncommon and an overly-restrictive proxy means test, and so change is already needed" GiveDirectly, Update for GiveWell, September 2015, Pg 9. [GiveDirectly] is also considering modifying its targeting criteria to include certain types of people who may be especially vulnerable whether or not they live under an iron roof. Other additional proxies (e.g., widows)"
GiveDirectly, Update for GiveWell, September 2015, Pg 9. To test possible proxies for poverty to use as its new criteria, GiveDirectly attempted to determine the validity and replicability for each metric, and also solicited community feedback (more detail on GiveDirectly's process in the footnote). 4. Collected consumption data as part of our household census for ~500 households in Homa Bay (see “Consumption data for targeting work” which includes the most complete survey versions)—the monthly per-capita consumption figure gathered from this was the measure of each household’s poverty. 5. Analyzed consumption data to see if there were strong predictors of poverty among household’s observable characteristics. Requested analysis and advice of several data scientist volunteers. Unfortunately, there was no single, strong predictor of poverty like thatch. 6. Developed multiple possible criteria (i.e. models) (See “Targeting criteria analysis summary”) based on the piloting and analysis experience, using factors that were the strongest predictors of poverty, fair, and difficult to game. 7. Selected one of the models based upon our priorities of accuracy, perceived fairness, lack of gameability, and cost." For example, GiveDirectly tested the same criterion on the same group of people at different times to see if respondents gave consistent answers that led to the same group of eligible recipients each time. "A full set of asset questions are oftentimes only relevant when we are re-assessing poverty of a particular region, or assessing it for the first time when we enter a new region. In addition to assets, we may consider other factors such as housing materials, facilities (latrine, roof, floor) etc. The exact set of factors considered changes across communities to reflect the complex variations of poverty. We also continuously test and tweak our set of criteria based on our analysis. This is why you may see different sets of information (assets/facilities etc.) collected across different geographies." GiveDirectly staff, responses to monitoring questions, October 11, 2016, pg. 1. "We wanted to evaluate how well different techniques worked along several dimensions. We looked for accuracy (did the method actually identify poor households), perceived fairness (did community members think that the method was fair), gameability (how easy was it to cheat the system), and cost (how expensive was the method to administer). We will write more about the targeting project on our blog over the coming months. Besides testing and evaluating different techniques, the project allowed us to settle on usable eligibility criteria for our new home in Homa Bay. We found that there was no single, objective replacement for thatched roofs as a criterion (e.g. mud floors or the presence of a latrine) in our new location that also met the bar for accuracy, perceived fairness, gameability, and cost. We also found that some methods that might work well in other contexts didn’t work well in Homa Bay. For example, community-based targeting was perceived as fair and was cost-effective, but it was not particularly accurate, in part due to the high prevalence of clanism in Homa Bay – villagers were sometimes nominating those in their own clan over the poorest households in the community." "There are major differences between this method and the thatch and homeless criteria we used in Siaya. Because the new criteria take into account many factors, it’s harder to game the system. Also, the new criteria include a broader range of vulnerable statuses than the criteria in Siaya by adding widows and child-headed households into the algorithm. This is likely to increase the perceived fairness of our eligibility criteria. The new criteria also have some weaknesses: it’s slightly more expensive from an operational standpoint, because the criteria involve more questions, and it is more difficult to explain to community members why a given household was or was not eligible. This may counteract the perceived fairness of enrolling more vulnerable-status recipients. Taking all of these dimensions into account, our new eligibility criteria will allow us to identify and serve the poorest of the poor in Homa Bay. Even though the new criteria make this system slightly more expensive, that cost will likely be mitigated by a decrease in gameability and an increase in accuracy. And although the new algorithm may be perceived as harder to understand, we hope that by accounting for vulnerable-status groups the criteria will be perceived as more fair in the communities where we work." Con: more expensive to administer as there are more questions to answer. Cost savings from reduced gaming may offset this. Taking all of these: we think cost and fairness differences are probably going to be about the same, and so the major gain is the fact that it is difficult to game" Carolina Toth, email to GiveWell, October 20, 2015. "Pro: harder for all parties to game, as algorithm is not known" Carolina Toth, email to GiveWell, October 20, 2015. GiveDirectly, Offering Memorandum (January 2012), Pgs 23-24. GiveDirectly, What We Do - Operating Model, see the Uganda tab. GiveDirectly, Offering Memorandum (January 2012), Pg 25. The data reported for this variable in Table 4 of Haushofer and Shapiro 2013 Policy Brief, Pg 32, appears to demonstrate that 21% (not 20%) of the control group reports that not all household members usually eat until they are content. Haushofer and Shapiro 2013 Policy Brief, Pg 18, corresponding data in Table 4, Pg 32. ”Households seem to be as or more needy than typical GD recipients"
"Some (but not all) mabati [iron-roofed] or even permanent HH are as deserving as thatched HH […] 6/6 groups mentioned deserving special cases." GiveDirectly, Saturation analysis, Pg 4. Mr. Ekeu thinks that roofs are too rough a way to target poverty because some people may live under an iron roof but actually be very poor (e.g., someone who inherited an iron-roofed house from his grandfather, or a widow whose late husband built her an iron-roofed house long ago). Ms. Mukhopadhyay said that GiveDirectly hears this kind of feedback from a lot of its field staff, but believes that building materials are still a good criteria on average. Mr. Ekeu [the Senior Field Officer in Uganda] thinks that roofs are too rough a way to target poverty because some people may live under an iron roof but actually be very poor (e.g., someone who inherited an iron-roofed house from his grandfather, or a widow whose late husband built her an iron-roofed house long ago). Ms. Mukhopadhyay said that GiveDirectly hears this kind of feedback from a lot of its field staff, but believes that building materials are still a good criteria on average. It is also considering modifying its targeting criteria to include certain types of people who may be especially vulnerable whether or not they live under an iron roof. Conversation with GiveDirectly field staff, October 20-21, 2014, Pg 4. Paul Niehaus, GiveDirectly Founder, email to GiveWell, November 20, 2012. One adverse event reported in the Kenya follow-up tracker involved a case of domestic abuse resulting in the death of the mother and child, where the particular instance of conflict may have been related to the use of transfer funds. When GiveDirectly investigated the event, the parents of the deceased expressed that there was not anything GiveDirectly could have done to prevent this adverse event. People in the community, including the parents of the deceased, also said that they did not want to report the incident because they were afraid that it would cause GiveDirectly to cancel the cash transfer program, which they did not want to happen. Conversation with GiveDirectly, July 7, 2014, Pg 5. We asked the field officers what they think about the current transfer size (&dollar;1000), and whether they’d choose to keep it at that level, increase it, or decrease it, given the effects that an adjustment would have on how many people GiveDirectly would be able to serve. Mr. Okello: Typically there are multiple households on one compound, each inhabited by relatives of the same family, and any household that meets the targeting criteria can receive transfers. Mr. Okello said that it may make more sense for GiveDirectly to group some households on a compound together so that transfers are shared across them, rather than each eligible household receiving the full &dollar;1000. Mr. Okello also said that if GiveDirectly increased the size of the transfers, that could create a high level of dependency. One of the messages that field officers send is that people should use the &dollar;1000 transfers to develop themselves as much as possible, but if someone knew they were getting &dollar;2000, they may stop farming, for example. With &dollar;1000 people can get some things but not everything; it is the right amount. Mr. Ekeu: Mr. Ekeu prefers reducing the amount of money in each transfer and expanding the recipient base to reach everyone in the village. He said that the current targeting model causes bragging and unrest in the communities. The people who don’t benefit may be brought to use force to get some of the money, such as by breaking into recipients’ homes. Mr. Ekeu suggested that it would be better for GiveDirectly to provide all households in a village with some amount of money, even if it was less for households that are currently deemed ineligible (e.g., &dollar;100). This way, each of the households would be busy figuring out how they would spend their own money rather than how to get money from another. Conversation with GiveDirectly field staff, October 20-21, 2014, Pg 5. "In general, an overwhelming majority of eligible recipients opt to receive cash transfers from GiveDirectly. In Siaya, where GiveDirectly Kenya has operated from 2011 to the beginning of 2016, over 95% of recipients who are given the opportunity to be a part of the program accept it. In Uganda and Rwanda more than 96% of eligible recipients have opted in, respectively. These figures are high relative to participation rates in typical development programming, which is not surprising given the unconditional nature of our transfers. For example, Manuela Angelucci and Orazio Attanasio found that Oportunidades, a conditional cash transfer program in Mexico, had take up rates of roughly 50%. Oriana Bandiera et al. report that a BRAC training program targeted at adolescent girls in Uganda expected participation rates of roughly 20%. Recently, however, we’ve seen lower than usual participation rates in parts of Kenya. In July 2015 we entered Homa Bay, a new county and our first venture outside of Siaya. In Homa Bay and the neighboring areas, roughly 45% of the households we speak with decline to be enrolled into the program. As it turns out these challenges have been common for NGOs working in the area. Other development programs focused on HIV, water and sanitation, agricultural development, education, and female empowerment have also faced community resistance." "While GiveDirectly is still determining the root causes of this problem, it has developed a few hypotheses. These include the presence of vocal religious or political leaders who might believe they have reason to mobilize the community against the payments (such as politicians who worry the organization or payments may be aligned with their opponents), or a history in the area of hostility to NGOs born either of bad prior experiences or otherwise. Recently, GiveDirectly engaged in productive conversations with some of these stakeholders. The problem might also be exacerbated by the upcoming national elections." GiveWell's non-verbatim summary of a conversation with Ian Bassin and Piali Mukhopadhyay, GiveDirectly, August 23, 2016, Pg 5. "GiveDirectly has seen an uptick in the rate of refusal to participate in its cash transfer program in Homa Bay. The root of this development is not clear, and GiveDirectly has not yet identified a solution. In some cases, community members are led by local religious leaders or local government to mistrust the program. In Siaya County, this issue did not arise, possibly because GiveDirectly covered such a large portion of the county that in any new area it entered, people were already aware of the program and knew that it was trustworthy. GiveDirectly has attempted to allay these suspicions by meeting with local government and religious leaders and speaking on local radio shows to explain the program’s purpose. In villages where the refusal rate was high, GiveDirectly put some recipients on an accelerated schedule so they could receive their transfers more quickly and serve as an example to others. After returning to these villages, however, GiveDirectly found no change in public opinion. For this reason, it has not attempted to re-enroll those who refused, but might do so in the future." GiveWell's non-verbatim summary of a conversation with Paul Niehaus, Carolina Toth, and Ian Bassin, February 23, 2016, Pg 5. "We’ve debated how much effort to expend trying to address the refusal issue. We considered leaving Homa Bay since working in an area with lower refusals would be better for efficiency targets and staff morale. However, ultimately we decided to stay because we are in the process of implementing a large scale research project in Homa Bay, and leaving the area would result in meaningful delays and cost overruns for our research partners. We also believe it’s important to try to address the issue here or else rumors could spread to other areas we’ve not yet been. So far we’ve tested several different approaches, with varying degrees of success. We’ve significantly expanded our outreach effort by creating a team dedicated to grassroots mobilization. We’ve also gone on the radio several times, enlisted the help of local opinion leaders, leveraged testimonials of past recipients, and much more. In some areas the results were promising. In parts of Nyando subcounty we saw refusal rates dip from 80% to 20% within a two month period. Other areas proved more difficult; in another subcounty (Rachuonyo East) refusal rates have stubbornly hovered around 40% for weeks." "GiveDirectly created an outreach team to focus on this issue, which has been operating for three months. The team is employing a variety of different tactics: for example, it is communicating with relevant community stakeholders and using media to disseminate recipient testimonial videos and other materials. It will use A/B testing to assess the effectiveness of different strategies. During a period of a couple of months, the refusal rate dropped from an average of 70% to 20-30%, but it has rebounded significantly in the last couple of weeks." GiveWell's non-verbatim summary of a conversation with Ian Bassin and Piali Mukhopadhyay, GiveDirectly, August 23, 2016, Pg 5. "High refusal rates primarily impact the productivity of census teams; for example, if 50% of households refuse registration, the team must replace them with new households. In order to continue to reach enrollment targets in Kenya, GiveDirectly has provided additional support by increasing census team sizes and adjusting team members' locations. As lists generated by census teams only include eligible and interested recipients, refusal rates are much lower during subsequent steps. In Kenya, GiveDirectly's enrollment numbers are still roughly 10% above target; this margin is even greater in its Uganda program." GiveWell's non-verbatim summary of a conversation with Ian Bassin and Piali Mukhopadhyay, GiveDirectly, August 23, 2016, Pg 6. "Following its Google-funded campaign, GiveDirectly surveyed recipients in detail on how they spent their transfers. Given the limitations of this kind of self-reported data, GiveDirectly has not continued this practice. It prefers to rely on more accurate data gleaned through randomized controlled trials (RCTs), and expects to collect more [of] this type of information in future studies or campaigns, such as its ongoing RCT in coffee farming communities." GiveWell's non-verbatim summary of a conversation with Ian Bassin and Piali Mukhopadhyay, GiveDirectly, August 23, 2016, Pg 4. Note that in some cases, we have cleaned this data (where it was obvious what the error was in the data entry). These cases have been marked with cell comments. In other cases, when it was not clear what the error was (for example, when an amount of funds was mistakenly placed in a spending category column, and it was not clear whether the amount was intended to be placed in the former or latter column), we deleted the data and commented on the cell to indicate that data had been deleted. Deletions were made no more than 5 times in any given spreadsheet. The tables include follow up survey data from the Kenya 2M, Kenya 1.2M, Kenya rolling enrollment, and Kenya behavioral optimization campaigns and from the Uganda pilot campaign. Note that recipients may have been surveyed more than once and would therefore be included more than once in the data presented. 99. In follow up surveys administered in Uganda, recipients were asked about spending on large household items and small household items. The figure reported here is the combination of those two categories. GiveDirectly, What We Do - Who We Serve, September 2016 See the chart in the upper left section of the web page. For a list of follow-up survey questions from 2013, see GiveDirectly, Kenya verification template, August 2013. Note that this template may now be out of date. Note that not every follow-up survey asks about precisely the same issues (e.g. some do not ask about domestic violence or trouble collecting), which is part of what accounts for the different sizes of each group of respondents. 105. In the Uganda follow up data, this issue is denoted "stole_item." 106. In the Uganda follow up data, we identified 4 issues that we believe all asked about bribes ("bribe," "pay to collect," "others_bribes," "agent_bribe"). We only include the "bribe" issue in this table for Uganda (which has the highest rate of complaints out of the four). GiveDirectly sent us its July 2015 - February 2016 financial documents with a different breakdown than we have worked with before, so have not combined the data into one comprehensive summary. GiveWell, GiveDirectly financials 2015 Sheet: "2015-Total spend + efficiency." Note that the incurred "direct grants to households" includes transfers that GiveDirectly has already officially committed to, but not yet sent. GiveWell, GiveDirectly financials - May 2016 Sheet: "2016 May - Total expenses"
For example, the National Institutes of Health funded Innovations for Poverty Action to conduct the RCT of GiveDirectly's program: "GiveDirectly is conducting a longer-term evaluation to provide more detailed, context-specific evidence on how its recipients use cash transfers. The study is coordinated by an external research organization, Innovations for Poverty Action, led by Dr. Johannes Haushofer of Harvard University, and funded by the National Institutes of Health." GiveDirectly, Offering Memorandum (January 2012), Pg 26. In late 2015, GiveDirectly had set aside roughly &dollar;2.4 million in reserves. GiveWell, GiveDirectly financials 2015 Sheet: "2015-Balance Sheet." Note that in budget year 2016, GiveDirectly decided it only need &dollar;1 million in reserves. See GiveWell, GiveDirectly financials - May 2016 Sheet: "Budget and RFMF"
GiveWell, GiveDirectly financials - 2016 Sheet: "2016-efficiency ratio." 111. Includes Core Operations and Core Operations-general. Excludes fundraising. See our 2016 cost-effectiveness model. "We expect efficiency for the UBI program to be modestly worse than our typical program, averaging across the 3 arms to 84% (v. ~90% typically). Transfers per recipient are larger for the long-term arm (~&dollar;3K). We expect nominal enrollment costs per adult recipient to be modestly more than for our typical program (but to be a smaller %). FX costs maintain the same percentage, and mobile money costs are moderately worse (because smaller withdrawals are charged higher %s). We expect to incur roughly the same follow-up costs as our lump sum program for each year of the long-term UBI. As a result, follow-up costs make up a larger proportion of the overall costs of the project than they do typically. The short-term and lump sum arms are less efficient than the long-term arm, because they incur equal nominal enrollment costs, and comparable % follow-up, management, and transfer fees, relative to a total transfer amount that is lower. We will refine these estimates as we pilot the project in one village this month and finalize our workplan for the full study enrollment." "GiveDirectly stops issuing transfers after two years and clearly informs recipients that they should expect this." GiveDirectly, Offering Memorandum (January 2012), Pg 33. For example, see the Behavioral interventions study in this spreadsheet. &dollar;0.65 in pre-cash-transfer consumption per person per day implies (365*&dollar;0.65) = &dollar;237.25 per person per year. If each person receives &dollar;288 in a year from GiveDirectly, that's (288/237.25) = 121%. Note that recipients in Uganda live on &dollar;0.83, according to GiveDirectly's website (we believe this is referring to consumption because GiveDirectly's comparable figure for Kenya is &dollar;0.65). GiveDirectly, What We Do - Operating Model, see the Uganda tab. So the calculation in Uganda would be (365*&dollar;0.83)=&dollar;302.95. (&dollar;288/&dollar;302.95)=95%. Note that GiveDirectly has told us that recipients in Homa Bay have a slightly lower average daily consumption of &dollar;0.50. GiveDirectly, Consumption data for targeting work So, the calculation in Homa Bay would be (365*&dollar;0.50)=&dollar;182.50. (&dollar;288/&dollar;182.50)=158%. Paul Niehaus, GiveDirectly Founder, email to GiveWell, November 20, 2012. We have not reviewed the data GiveDirectly used to reach this conclusion. Do you think it would be better for GiveDirectly to provide &dollar;1000 transfers to households in one village or &dollar;500 transfers to households in two villages? Do you think that GiveDirectly should keep the transfer size the same or reduce the transfer size but provide transfers to a greater number of people? Conversation with GiveDirectly field staff, October 20-21, 2014, Pgs 5-6.